AKIPRESS.COM - Kazakhstan became the latest National Federation in Asia to be familiarized with the New Competition System with the workshop conducted by International Basketball Federation's Regional Office in Asia, according to the official website of FIBA. 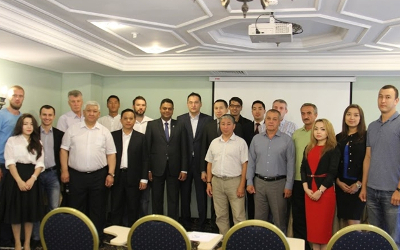 The two-day workshop had representatives of Kazakhstan's National Olympic Committee, city government of Astana and regional associations of the Kazakhstan National Federation participating. The participants were taken through the complete gamut of the New Competition System, preparing them for FIBA's flagship program that is set to tip off in November 2017. "Hats off to FIBA for bringing a change in the way basketball will be played and perceived," said Serik Kaskabassov, Executive Director of Kazakhstan NOC. "We have always wondered what it will take for us to host the national team in an important basketball event in Kazakhstan. I think this new system is just about the perfect recipe to meet our aspirations," he added. "The New Competition System will certainly change the way basketball is seen in Kazakhstan," said Arman Tashmetov, Director for International Relations of Kazakhstan NOC. "The New Competition System provides us the opportunity to rehaul and upgrade our capabilities as an event host. But then when we have the opportunity of the national team playing in front of our fans, I think the challenges are par for the course," Abay Alpamyssov, president of Kazakhstan NF., said. Kazakhstan played host recently to the 2016 FIBA U18 3x3 World Championships.